Hi Everyone! 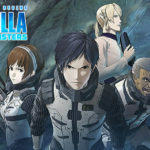 I know, it has been a while since my last blog entry on this site, but now I would like to try out something special and new. As you might know, I have been preparing for my advanced language exam for a while, and I will take this exam on the 9th of November. (On the next week’s Friday – Oh my God, it’s so close!) Because of it, I have to read and watch a lot of things in English since I’m not a fast learner – I have difficulties with listening exercises and so on. To put it short, I have to practise extra hard like an excellent eager beaver. 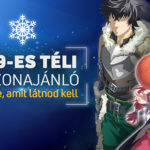 To make this report on my way of a foreign language learner short, I turn right to the point: in this blog entry I will present you a review in English about a novel and several adaptations (TV mini-series, movie) based on this novel that I have just read. Before the start of my review, I would like to make one thing clear: this review or I could say article may be grammatically incorrect with errors and omissions, but please be tolerant with me. I just hope that despite of my imperfection you will all understand what I have written down. 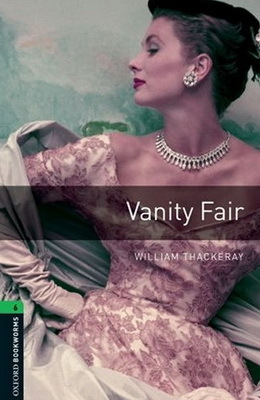 So, have a good time while reading my review about the novel Vanity Fair (1848) from William Makepeace Thackeray (1811 – 1863). William Makepeace Thackeray’s novel is telling us a romantic-drama about two girls, who were the complete opposites of each other, but were very good friends at the beginning. The two of theme studied at the same school for sophisticated young ladies and after ‘graduation’ they tried to marry as soon as possible, like a perfect lady ought to do at that period of time. One of theme was Amelia Sedley, who was shy, modest, and not so beautiful but a very warm-hearted girl, coming from a rich family. The other heroine, Becky Sharp was intelligent, clever and cunning as a fox, and an extremely stunning girl with ruddy hair and sparkling green eyes. In spite of her enticing look, she was very greedy; cold hearted and could trick anyone for money without a second thought. She was poor, her family background was unacceptable by the upper class – her father was a painter, her mother was a ballerina, but alcohol destroyed her happy family life then the sudden death of her parents made her an orphan at a very young age. Despite these tragedies she remained strong and skilfully climbed up the ladder of society. As a talented ‘actress’, she tried to seduce noblemen and after marrying into a baron’s family, it looked like everything would go smoothly for her. At the same time, the angel like Amelia’s life turned from worse to worse. At first, forced by his father her beloved Captain George Osborn broke off their engagement leaving the girl crying her eyes out. The reason was a crisis which approached Amelia’s family and crushed their highly acclaimed position in society and wealth. Amelia’s family was getting poorer and poorer, but the girl remained strong, still loving the prodigal Mr Osborn, the son of a strict father. Mr Osborn didn’t actually love poor Amelia, and wanted to continue his shameful life with gambling and alcohol. But his best and faithful friend, William Dobbin – secretly in love with Amelia – persuaded Osborne to marry Amelia against his father command. This made the old Mr Orborn furious and he cut the young couple off with a shilling. After these climaxes, Amelia and Becky along with their husbands met again and their emotional and sometimes melancholic relationship had changed because of money, jealousy, mistrust and the approaching Napoleon war. With these exciting developments and storm of emotions with one-sided loves the story was so fascinating that I wasn’t able to stop reading it till the end. Becky was a typical bad heroine, who you dislike from the very beginning, but who made the conflicts more interesting and made you curious all the time with the question: what will she do next? Meanwhile, Amelia’s blindness for true love and unreasonable faithfulness to her neglectful husband was irritating. The only character whom I loved from the bottom of my heart was Mr Dobbin, who fell in love with Amelia at first sight and waited sincerely eighteen years for this dull girl. He was so brave, admirable and self-sacrificing when he gave up his own desires for Amelia and helped her to reach happiness with the embrace of another man. He was so noble during the novel he didn’t even badmouthed the unfaithful Mr Osborn. 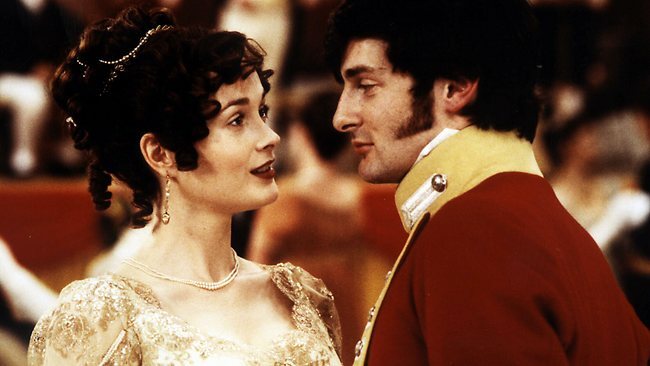 His character was like Mr Darcy from Pride and Prejudice, who did the same thing for Elizabeth. They both tried to make the woman they loved happy at the cost of suffering and wistfulness. There is one more similar figure (Florentino Ariza) like this in the novel entitled Love in the Time of Cholera (1988) from Gabriel García Márquez, but there is a difference: the hero of this novel, Florentino, was a love rat. 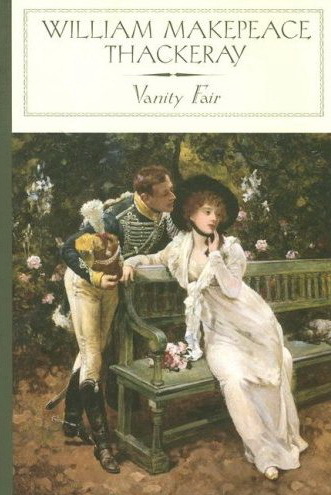 Beside Mr Dobbin’s misery, there was comedy and sarcasm in Vanity Fair. Capricious character like Mr Jos Sedley made me laugh all the time with his bluntness and voraciousness, and Becky was so critical, witty and censorious while she had great insight to the ridiculous and hypocrite society of the high class. Beside her, I loved her husband, Mr Rawdon’s personal developments. At the beginning, he was a selfish and egoistic man who loved gambling and was always in dept. Fortunately, love and the birth of his son changed him in a good way, but sadly, Becky destroyed him in the end with her thirst for money. The only true loser, who really deserved a happy end was him. His drama was so touching that I nearly cried for him. 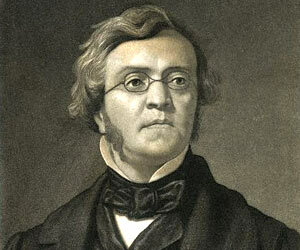 Otherwise, William Makepeace Thackeray’s masterpiece gained him great popularity and name in the English literature world. 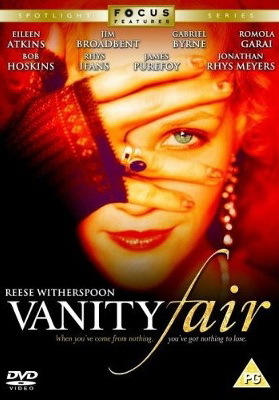 Vanity Fair is very enjoyable with its clichéd characters, who cannot divided into positive and negative sides. In addition everyone in this novel has his or her bad and good points, they can make mistakes, and they can harm each other, but they can laugh and be sweet at the same time. The value of money and love is tested during the story, and with justice winning in the end, everyone (beside Rawdon) get what they reserved. The original novel published in twenty chapters between 1847 and 1848 in the Punch magazine. Moreover, the novel remained so popular that four silent films, three movies and three BBC mini-series were made based on it so far. Also, the well-known Orson Welles, who made the most famous broadcast in the history of radio with The War of the Worlds (1938), created a one-hour long radio play adaption of the novel in 1940. What was written and what was filmed? What about the film adaptations of the original story? Did they give the same impressions as the novel? I could say partly yes and no. I watched two pieces of the adaptations; one was a six-episode-long BBC mini-series from 1998, and a theatrical movie from 2004. I would like to say that I loved both of them, but the most touching and most unique experience was given to me by the movie. For comparison let’s see some differences between the movie and the TV mini-series. 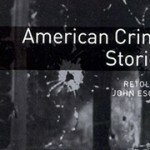 The TV mini-series is a simple but true adaptation of the novel. In the six episodes you can hear and see the exactly same things as you read before in the novel. Here Becky is a really wicked woman from the start; she is a cheeky little thief. The historical setting is greyer or more loyal to reality with not so beautiful British actors. The movie is filled with exotic and artistic scenes with a lot of color and outstanding taste of fashion. The first differences you can see at the very beginning with a party which is portrayed as an Indian happening in the movie while in the mini-series it’s an average gathering between the high class’ society. The look of the main two heroines has also changed. In the version of BBC’s Becky had red, and Amelia had blonde hair, while in the movie it’s reversed. 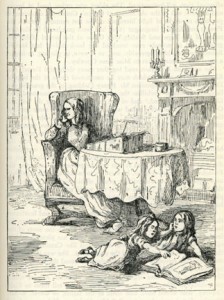 In the movie Becky (played by Natasha Little) was in the centre of all of the attention, while in the series everybody, especially Amelia (played by Frances Grey) had a main role. I could say that, these two characters were brilliant in the mini-series, especially Natasha Little who is a voice actress in the video game series called Dragon Age, and appeared in the mentioned Vanity Fair movie (2004) as an old lady. 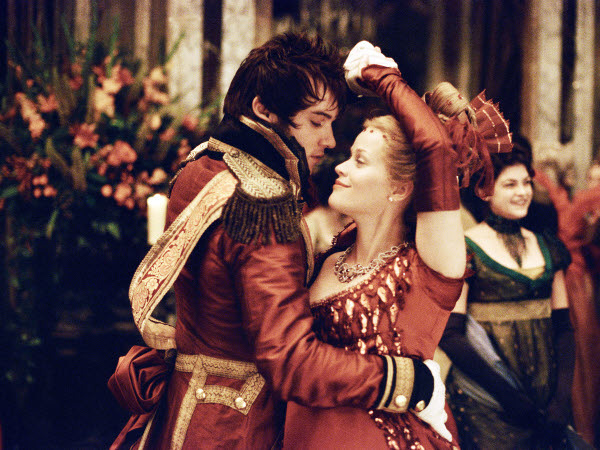 Screenshot from the Vanity Fair movie (2004). 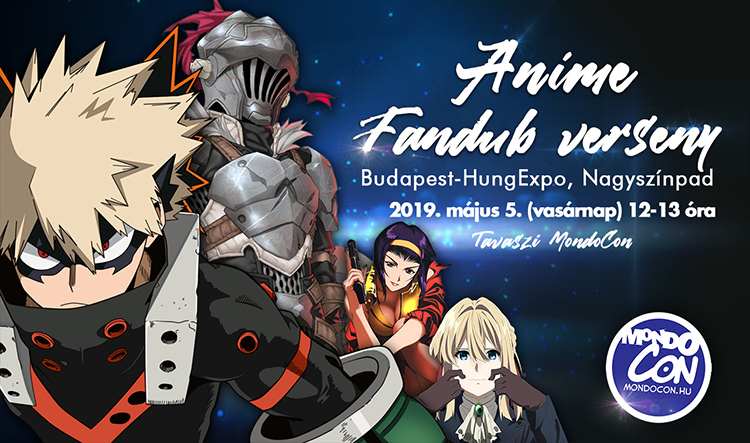 All in all, Vanity Far novel is a masterpiece that everyone should read at least once in a lifetime, and if you interested, you can choose from several adaptations from which you can get different aspects of the original story. First of all, good luck with your exam. Second, great article and congratulations for the effort you put into writing it. If you allow me to assist you, I would like to help and further your preparations by pointing out some of the minor mistakes I found in your article. In general, you should pay more attention to the word order and the genitives. Though I don’t think you will have much trouble passing the exam. Amelia blindness for true love and unreasonable faithfulness to her neglectful husband were irritating. – Amelia’s blindness for true love and unreasonable faithfulness to her neglectful husband was irritating. helped her for reaching happiness with the embrace of another man. – helped her to reach happiness with the embrace of another man. Lord Steyne, who had just a supporting role in the novel, in the movie he gained importance and symbolized or proved the ruin of Becky. – Lord Steyne, who only had a supporting role in the novel, gained importance in the movie and symbolized or proved the ruin of Becky. His character was acted by the amazingly talented Gabriel Byrne. – His role was played by the amazingly talented Gabriel Byrne. 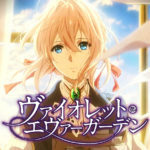 The main two heroine outlook is changed, too. – The look of the main two heroines has also changed. Vow, I’m so grateful! Thank you for the effort! I have corrected everything what you mentioned. You are like an online english teacher for me ^^. If you want to practice you can hit me up on gtalk or if you have an IRC client, you can usually find me at irc.rizon.net in #banana. It looks like this was posted quite a while ago now, but I’ve only just stumbled across it. I just wanted to say thank you for sharing your thoughts on Vanity Fair, and you did very well with your grammar and spelling 😉 I hope your English exam went well!